VHS was developed by JVC in 1976 and became the standard in the home video industry. Typical tape lengths were 120, 180 and 240 minutes with the 180 being the most common. These times can double if recorded in LongPlay. There is also VHS-C - a camcorder tape which is a smaller cassette and has to go into an adapter to play back on a standard machine. 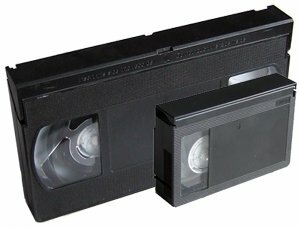 S-VHS and S-VHS-C are higher quality versions of VHS. We use 16gb branded USB sticks which cost £6 each. We can get about 6-7 hours onto 1 memory stick. You are welcome to supply your own memory sticks or portable hard drive. Have extra copies of your transfer. Prices are from £5.00 each per disc for up to 5 copies. Discounts available for more than 5. With the Premium service your video is transferred to computer first. We do some basic editing and tidying up, chapter points and a personalised menu are then added before copying to DVD. Please note this is not as comprehensive as our editing service. Prices from £45 per 2 hours on a disc. Two hours on a DVD is the optimum quality. Tapes with more than 2 hours of content are copied to 2 DVDs. Each DVD comes in a free DVD library case and includes a free title printed on disc. Some cases are multi-disc cases. Customised case inserts are available. The cost depends on what you require. You can contact us using the form above or by visiting or writing to the address above, or using social media.